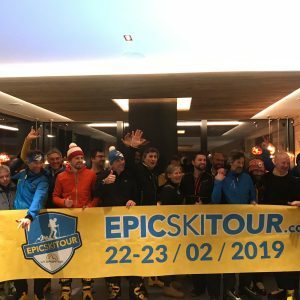 Welcome to Epic Ski Tour! 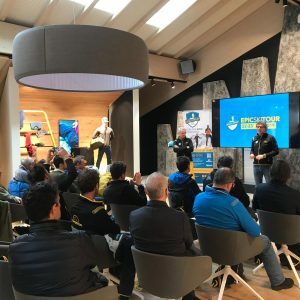 On 30 January, La Sportiva EPIC Ski Tour invited numerous sponsors, partners and journalists to a MEDIA DAY. 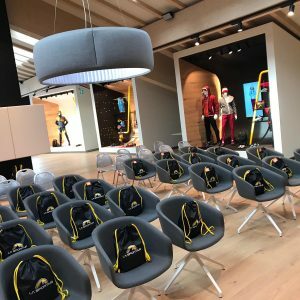 Around 11:00 a.m. the event was presented in the La Sportiva showroom. There was the new gadget, a Baselayer with EPIC Ski Tour Design, from UYN as a gift and an EPIC Ski Tour cap from Nordic Sky. Afterwards there was a gourmet menu by Monograno Felicetti. After lunch, the production and development site of the main sponsor La Sportiva was visited. Around 16:00 p.m. everyone who wanted could rent skis and boots for a skimo experience together with mountain guide Omar Oprandi. Trough freshly snowed forests of beautiful Val di Fiemme and deep powder the tour ended at the modern Chalet 44. At the Chalet a delicious dinner was prepared and so an amazing day comes to his end. Watch EPIC Ski Tour on Sportoutdoor.tv! Download NOW the race report of the first stage at Alpe Cermis! Subscribe to our newsletter to receive all the information, news and details about La Sportiva EPIC SKI TOUR!